Well; all I can say is I got Rachel Harrington all wrong. For some bizarre reason I’d always thought her to be an introspective singer-songwriter in the Nanci Griffith vein; but here…well she’s made the album that Dolly, Reba or Shania should be making but can’t/don’t – this truly is as Country as Country gets. 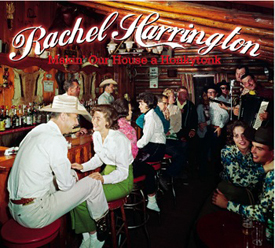 The album opens with some boot-scootin pedal steel and a twangy guitar before Rachel tells her man that she’s Makin’ Our House a Honky-tonk if that’s what it takes to keep him home. Wedding Ring Vacation could easily have been a Tammy song in her heyday but in Rachel’s hands is a perfect description of many bars on a Friday night. I’ll Show You Mine is a great title for a Country song and the twist is that it’s about broken hearts and not showing someone your ‘naughty bits’ and it’s a belter of a song; and well worth tracking down. Hippie in my House is a fun song about falling in love with the wrong person and could easily be a Loretta Lynn or Elizabeth Cook song and probably Elizabeth is the singer Rachel reminds me of the most as both ladies manage to channel the best of their peers but make music that is very much about today and today’s issues. There’s not a bad song on the album and when the crying in your beer anthem I’d Like to Take This Chance came to a close I actually felt cheated, as I wanted to hear more; much more, which is something that hasn’t happened for a long time. So the CD went back to the beginning and has been on the turntable for two days solid now and I’m still not bored with it.